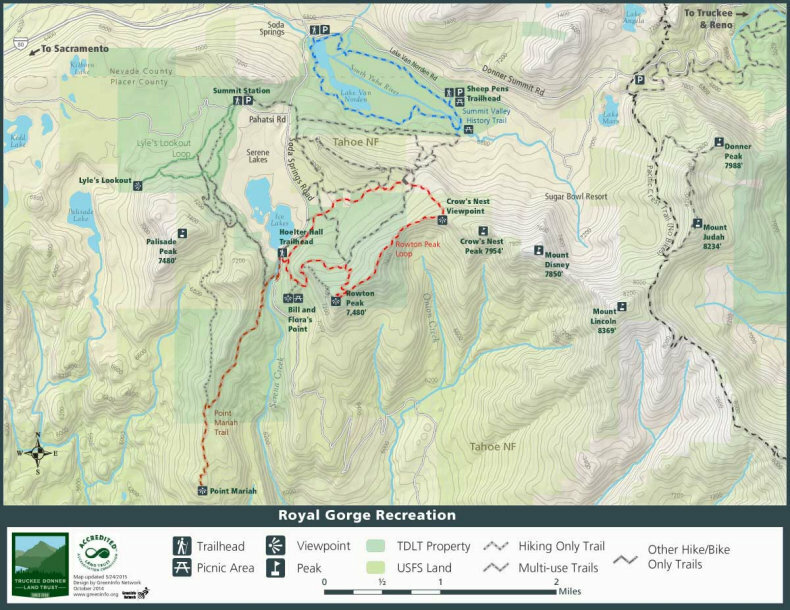 Summit trail use revisited – Yes, everyone can get along! Now that our second summer of trail use in the Royal Gorge area is coming to an end, I would like to revisit what we have learned from these two years. As many of you will remember, there was quite a bit of controversy over the implementation of a multi-use trail system in the area (see this prior post). Many people had concerns about crowded trails and trail conflicts between different user groups. Some of this concern was based on the notion that people from outside the summit area were going to flock to the trails. Another conern was that the area was going to become a mountain bike Mecca for extreme sports enthusiasts. Well, what really happened? I think the simple answer is NOTHING CHANGED MUCH. 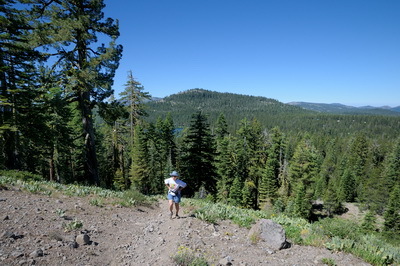 Truckee Donner Land Trust did implement a trail system in 2014 that is shown in Figure 1. The system for the most part utilizes parts of existing ski trails to put together defined trails through the entire property. They developed new trailheads at Summit Station and at the south end of Serene Lakes to provide parking and access. They also added two new single track trails and put in some erosion control on existing trails and trail construction is slated continue for the next few years. So let’s see what happened with respect to those initial concerns. In 2014 we did a trail usage survey by monitoring different trails in the area with a trail camera. The results of that survey are accessible at this link. The data from the survey pretty clearly showed that there was indeed plenty of use of the trail system. But contrary to initial concerns, while well used, the large capacity of the area made trail interactions minimal and to my knowledge there was no increase in trail usage conflicts reported. While we did not do a study this year, we have been out on the trails all summer both hiking and biking and of the few interactions we had with other users all were positive. We also did not hear of any serious trail conflicts in the area this year. I think it is also safe to say that the area has not become a mountain biking mecca. As a mountain biker myself, I did not really see any increase in mountain bikers on our local trails. In fact, on only three occasions all summer did I even see another biker or hiker on the trails. On those occasions we both gave a friendly wave and moved on down the trail. The bottom line is that with all the hoopla of the Land Trust acquisition, there may have been a small increase in the amount of trail use, but because the area is so large, there just hasn’t been much of change in personal trail use. I should probably also mention the organized trail run we had this summer by the RAGNAR organization. I know there was community concern about all the people attending this event. Considering that there were over a 1000 people competing and many people camping up at Summit Station, the event went very well. There was really minimum impact of the event on the trail system as well as the community. As long as events in the future are run as well as this one, I don’t believe the community should be concerned. I would like to conclude by congratulating the Land Trust and all the users of the trails in the summit area for making it a successful outdoor experience for everyone. It is the friendly and understanding attitude of everyone that visits the area that makes it such a great place to enjoy the beauty and wonder of the area.